Since my childhood, I have been a keen observer of animals, but it wasn’t until the latter years of my BSc at Mount Allison University that I was introduced to the world of research. Under the supervision of Jean-Guy Godin, my honour’s research on the mating behaviour of three spined-sticklebacks (Patriquin- Meldrum and Godin 1997) solidified my passion for animal behaviour, and whetted my appetite for field work. 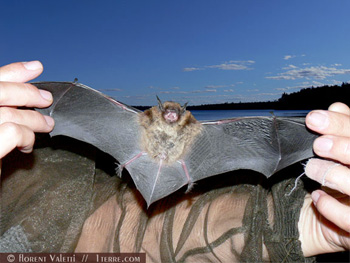 I moved across Canada to pursue my MSc at the University of Calgary with Robert Barclay to explore the behavioural ecology of the bat community in northern Alberta, near Peace River. Two summers of intensive field work can essentially be summed up in two sentences: 1) Bat species of different size and maneuverability respond differently to logging (Patriquin and Barclay 2003; Hogberg et al. 2002); 2) Ultrasound is not detected equally across all habitat types, but not in the way you might expect (Patriquin et al. 2003). After completing my MSc I decided to test the waters in the ‘real world’ doing consulting work, but realized it wasn’t for me. So, I returned to Canada’s beautiful east coast to do my PhD. I am co-supervised by Marty Leonard at Dalhousie University and Hugh Broders at Saint Mary’s University. I am investigating the social structure of northern long-eared bats (Myotis septentrionalis). In this species, females form maternity colonies where they give birth to and raise their young. However, the composition of these colonies varies spatially and temporally as females move between trees throughout the summer. I want to know if females have preferred associates and if so, who are they and why does such a preference exist. To address these questions, and with the help of assistants and volunteers, I spend my summers catching, processing and tracking bats, hiking in the forest and climbing trees. will be teaching Behavioural Ecology at Dalhousie. 1. Golder Associates Ltd. 2002. Suncor Firebag In-situ Project Supplemental Wildlife Surveys 2001. Submitted to Suncor Energy Inc.